Pakistan has made a bullet proof vehicle UQAAB, equipped with latest technologies. It is designed for military personnel and VIP transport. Full vehicle is protected with certified CEN B7/NIK IV armor which is equivalent to a 7.62 x 51 mm weapon shooting at 30 meters. Armor includes front, sides, rear, floor and roof. This monster vehicle is designed to protect driver and passengers from any incoming threat from any angle. It is also equipped with several armor enhancements such as a blast mitigation floor mat, provided with a roof turret, machine guns, spring loaded gun ports are integrated at each seat, Heating, ventilation and air condition system, automatic fire engine suspension and heavy duty 300 AMP Alternator. It is built on a heavy duty chassis, equipped with powerful engine and intelligent AWD system. UQAAB has the capacity of 8 passengers plus the driver and a co-driver making a total of 10 people. Seating system is designed to protect people from IED. This vehicle is built by Pak Armoring Company. 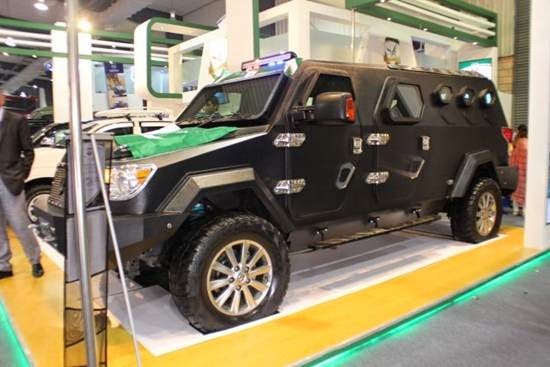 This armored vehicle was presented in IDEAS 2014 exhibition at Expo Center Karachi (Pakistan).